David W. Cameron completed his PhD in 1995 and was subsequently awarded an Australian Research Council (ARC) Post Doctoral Fellowship at the Australian National University, followed by an ARC QEII Fellowship at the University of Sydney. 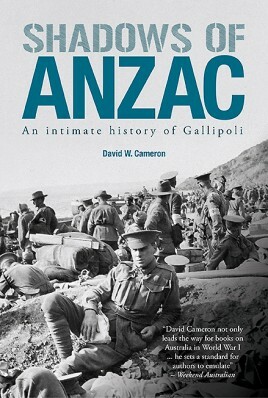 He has published a number of books on Australian military history and science and over sixty research papers in internationally peer reviewed journals.David’s passion for recording the overarching history of Gallipoli has resulted in six books on the subject. He is also internationally known as an expert on primate and human evolution and has a degree in both archaeology and palaeoanthropology.David was born in 1961 in Darlinghurst and grew up in Bondi before moving to Campbelltown in the early 1970’s when it was still a ‘town’. He graduated with 1st Class Honours from the University of Sydney (Prehistory) in 1989 and with a PhD from the Australian National University (Palaeoanthropology) in 1995.He was formerly an Australian Research Council QEII Fellow at the Department of Anatomy & Histology at the University of Sydney. He has conducted numerous international archaeological and palaeonathropological excavations in Europe, Middle East and Asia. David is married with three children (and two dogs).